An innovative creative writing project with local schools has earned recognition for The Grammar School at Leeds (GSAL) with a nomination for a national award. GSAL makes the shortlist in the category ‘Best Independent-Maintained School Collaboration’ at the Independent School Awards 2012 for its Speak Up! project. Speak up! saw Leeds poets working in five local primary schools and GSAL’s own Junior School, to inspire Year 5 children to devise original poetry based on their own experiences which they later performed to each other in a poetry slam. 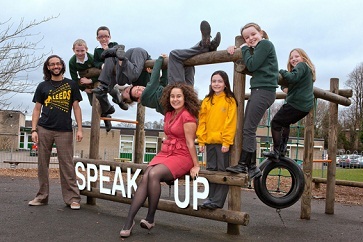 The schools that took part in Speak Up! were Little London, Oakwood and St Augustine’s in Leeds, St Mary’s CE Primary School in Boston Spa and Pool in Wharfedale C of E Primary School, as well as GSAL’s Junior School. Pool emerged victorious at the poetry slam in March. The nomination for this award also puts GSAL in contention for the title ‘Independent School of the Year’ which is awarded to one of the winners in selected categories. The Independent School Awards celebrate excellence in the strategic and financial management of independent schools in the UK, and the winners will be announced on 14 November. Poet Simon Murray and Jenny Webb are pictured with pupils at Pool in Wharfedale C of E Primary School.